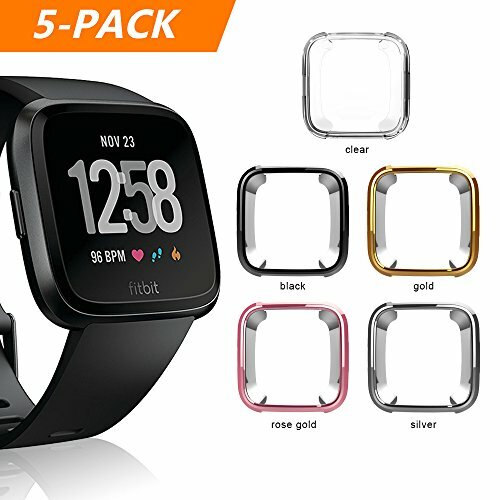 Case for Fitbit Versa, iHYQ Soft TPU Slim Fit Full Cover Screen Protector for Fitbit Versa Smart Watch (5 PACK) by iHYQ at Kode Fu Guru. MPN: IHYQfitbitversa1-5pack. Hurry! Limited time offer. Offer valid only while supplies last. MATERIAL: made of high quality plated TPU, your watch will looks more shining and durable with this case. 99% high transparency, still responsive and clear. Strong Function: this case covers the versa screen and curved edges, offer full protection for your versa to against scratches, drop and bump. Warranty: 24 months warranty guaranty, within 24 hours quick-reply and lifetime friendly customer service. Package Includ: 5 pack case as the picture shows. If you have any questions about this product by iHYQ, contact us by completing and submitting the form below. If you are looking for a specif part number, please include it with your message.